The bluejay pictured here is not having a bad feather day! Rather, he has just spent a significant amount of time in today's pouring rain — noshing from a suet feeder that I have in my garden — and, therefore, had no chance to blow dry his/her feathers! Soon it will be Independence Day! 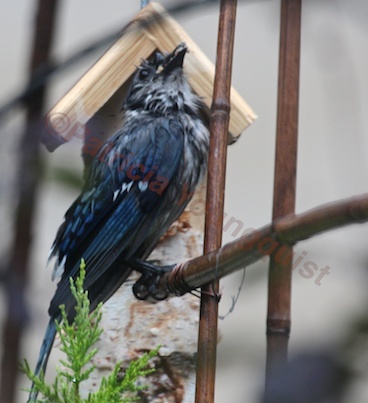 RAIN or SHINE Dining for my Wild Bird Visitors! Sorry Bert, "Doin' The Pigeon" is NOT for me!